The land of Sardinia has been a great pasta producer and exporter already since X and XV centuries. 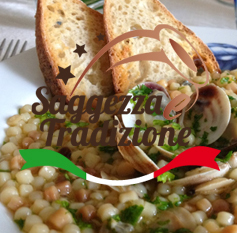 Among the different products “fregula” is the most characteristic of the region and it’s a very tasty and particular typical pasta. “Fregula” is a durum wheat flour dry pasta (its shape is very similar to that of couscous) which is manually operated to obtain small irregular and rustic balls with its unique and characteristic taste that comes from its natural drying and roasting. Its name takes its origin from the Latin word "fricare" (to scratch) properly for the scratching movement of the bran between the hands in order make the small balls. The processing to make it is a Sardinian tradition heritage. It’s an original invention of the island developed by Sardinian women that still nowadays, in some areas, conduct this ritual of making this product at home. Today it’s possible to find “fregula” also marketed by some local manufacturers. Copyright © 2014 - saggezzaetradizione. All rights reserved.